At the end of Ötillö 2016 we asked ourselves: ‘how could we go faster again?’ This was knowing we had picked off the easy changes. Not all of our races this season had gone to plan and I had doubts creeping in. Two weeks out and the time for fitness training was done. The only gains that could be made were mental. So we went out and had a couple of good sessions along the East Lothian coast. We ran on the rocks to find confidence, we swam in the sea, we tried out a new tow arrangement, we had fun, smiled and ate cake afterwards. So we arrived and made our way straight into town to pick up the new shoes! This was followed by café stop number 1 and an enormous cardamom bun. We got to our accommodation late but managed a nice run round town in the gathering gloom. No matter that my sense of direction went slightly awry and we did 5 miles instead of 5km. 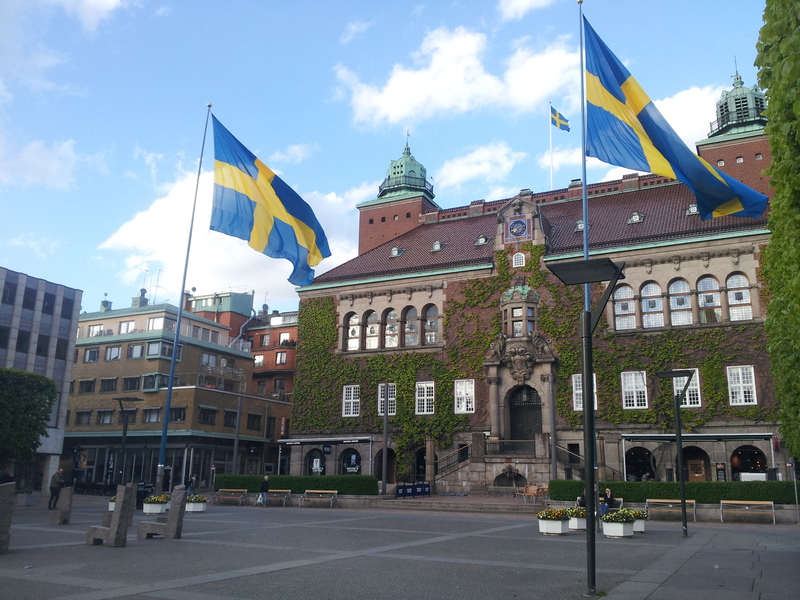 Stockholm feels familiar to us now, helped by the fact we went back to stay at the same place. 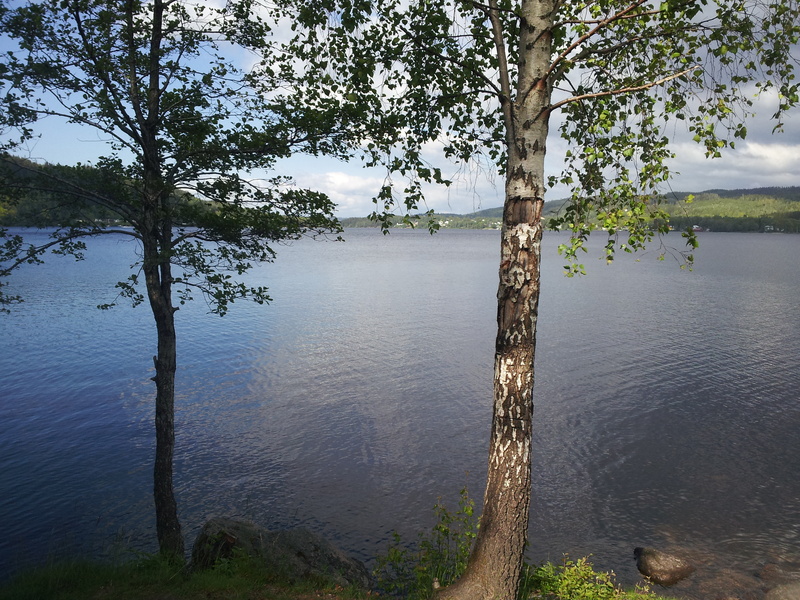 We had a lovely few days and managed to get ourselves out to the Tyresta nature reserve for a walk, beaver hunting, a swimrun session focussed on technical aspects and another splendid café. Saturday just time for fancy café number three, a swim at Hellasgården and a sauna, complete with cold lake dips. I would be allowed to tow as hard as I wanted on the easy terrain, without creating pressure on the trickier stuff. 6:30 / km sounded a breeze, just like a very relaxed training run without hills – how hard could it be? Izzy is the master weather checker and the closer we got to race day the more it looked to be moving in our favour. We willed the temperature to drop and the wind speed to rise. At the briefing it was apparent the weather was causing the organisers some serious concerns. I did not realise how close they had been to changing the race until later. However, they didn’t, and I am so glad! This is why I love swimrun more than triathlon. It is up to you to look after yourself and your partner and make your own decision about whether it is safe for you to continue. Nature and the conditions it creates are part of the race and the experience. The gun sounded and off we went. Someone fell over in the rush before we had even gone 100m. Soon we were at the first swim. We had come to look at this the day before and been left mystified as to where we were going. Turns out I’d been looking at the wrong island. Now we had a strobe light to aim for, 1700m away. This swim is sheltered but was still fairly rough. I thought this may mean later swims would be ‘interesting’. At some point the tow popped off Izzy – we’re not sure why – but she managed to grab the end before I swam off and gave it a good tug so that I stopped!! We landed and were onto the fabled rocks. Because of the rain they were wet and slippery again, like they had been our first year, except now we had our grippy shoes on. There were more teams in the race and we could feel it, as we got caught in a few short queues. I would skip and bound and nip through a gap, only to find I was separated from Izzy. I kept to my promise and waited, and she kept hers, maintaining a positive outlook. Despite other teams coming between us and slipping and sliding more than once, she did not let it affect her mood. On one tricky bit, I heard a cry out and looked back. Izzy was sliding down the steep rocks towards the sea! I quickly assessed the situation. There was nothing I could do to help, and at least she was heading feet first … Luckily she came to a stop before she hit the water and we were off again. But it was easy to see how several teams we saw during the course of the day needed medical attention. It’s always a balance between risk and speed. Into the second swim and I remembered it was better to head right. However, we got in to the left and weren’t tethered, so it was hard to change direction. I was also edging away from Izzy and was concentrating to make sure we stayed together. As we got out I was kicked in the face by the person in front. I thought I might finish the day with a black eye but it wasn’t so bad after all 😀 . We slid and slipped and I was all over the place as Izzy headed up the rocks! The safety boats may have had a tougher time out there than us! It felt like we were losing time compared to last year and failing even at the first hurdle of our plan. We got to the first longer run and headed for the feed station and cut off. Here I checked the time and was surprised to find we were still on target! I started thinking OK, so maybe we have a chance this plan will work after all, but we have to push on with the easy runs to do it. It felt hard and I reminded myself it was a race, and was meant to be hard work! I had belief that our timings were feasible, and that we’d done enough work and other races that the legs would know what to do without fear of suddenly fading. The second cut off had been revised due to the conditions and was 45 minutes earlier than previous years. If we’d had any issues it might have been tight, so I was keeping an eye on it. However, we sailed through, still within 1 or 2 minutes of our plan. This cut off is at an out-and-back so we could see from the teams immediately in front and behind that we were very much mid pack for the girls. Our friend Jenny had had to look for a last minute replacement partner and was racing with a girl called Cat. 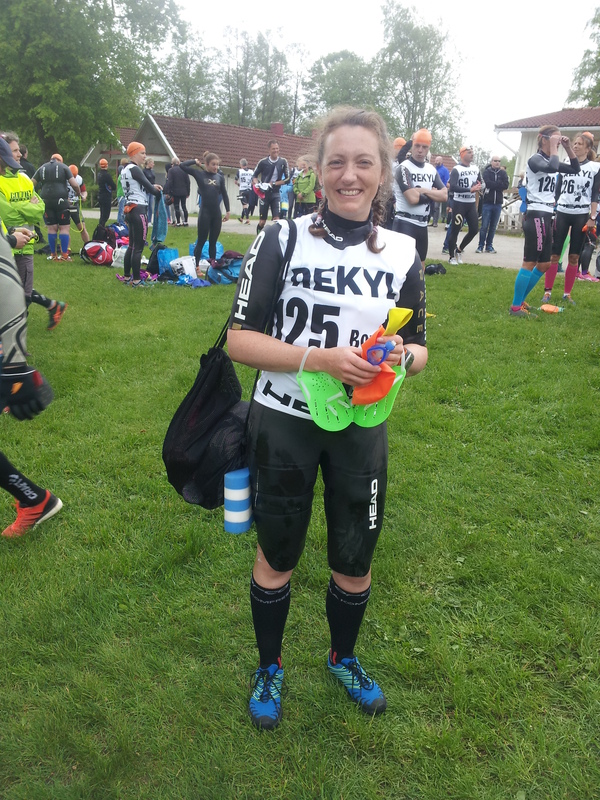 Cat had never done a swimrun before (!) so we were delighted to see them heading in together behind us! I thought if they had made it this far they’d be able to finish. Along the way we saw a bit of wildlife, especially a deer and Bambi jumping across our path. I also spotted an anthill and several harmless jellies the water. However, at dinner another British pair said they saw a dolphin, or was it a shark?! I think I was too preoccupied on the swims to have seen such a creature even if it had been right beneath me! 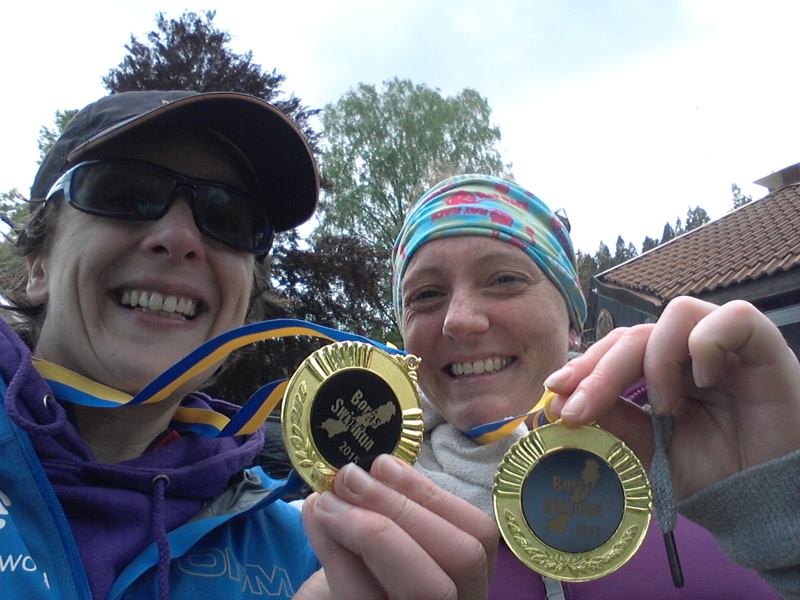 We had also been trading places with Marie and Malin just as we had last year, but this time we pulled away on the easy run. I expected to see them again later, but we never did. Tricky to run in places like this! Onwards we went. At some point we slowed to eat and get ourselves sorted at the start of a longer run. Teams passed us but we did not react and kept to the plan. It was important for me to eat! As soon as we settled into our pace again, we would overtake and make up places. One half of a mixed pair had fallen and was crying on the ground beside us. Her partner said maybe she had broken her ankle and we promised to get help. I knew we were close to a swim entry but there was no marshal and I didn’t think to use my whistle to get the attention of the nearest boat. It was a short swim and immediately the other side there was a film crew and I gave them the message. 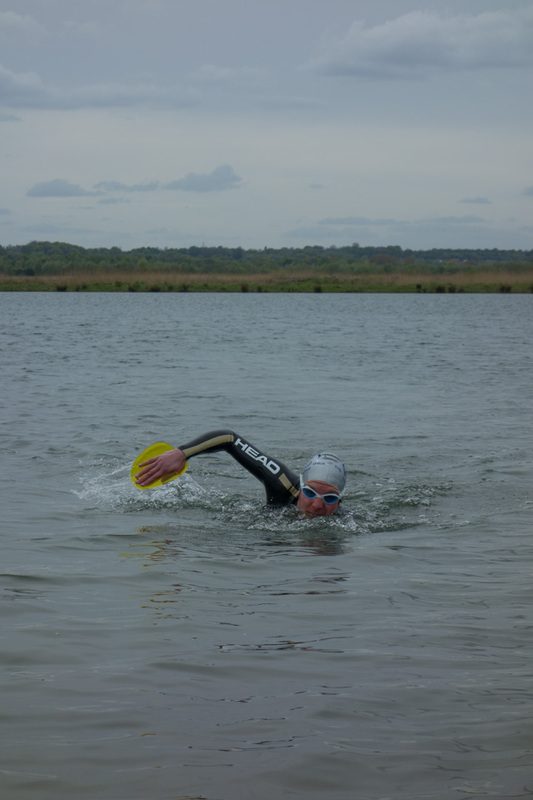 The Pig Swim – a few wiggles but no big bends! Soon enough, we passed through the garden full of noisy and musical supporters and then we were at the infamous Pig Swim. It looked rough like it had the first year we did it, but once we were in, the current did not feel so strong. It was windy and there was a lot of chop and white horses. The waves were coming from our left and I often felt like they were assisting with ‘good body rotation’, except sometimes this ‘help’ went too far! Sighting and breathing were difficult and unpredictable but we got straight over and were feeling pretty pleased with ourselves, if a little cold. We grabbed our Twix and kept moving. The next 1km swim actually felt more difficult. I was cold and it felt rougher. The water during the race was 12-15oC depending on the swim, but I think our state of fatigue and nutrition had an effect on how this felt. We made it and the next big stage was the half marathon, where we would really face the crux of our plan. Just before that we caught a clutch of female teams at a feed station. We all jumped into the 300m swim together and headed off. I was shivering hard but it was short and we’d soon warm up. I think we swam faster than they did, and headed off at speed on the other side. We definitely didn’t want to ‘cab down’ yet, and in fact didn’t need to for the whole run. Now we had to try and average 6:30 / km for an extended period. In doing so, we would make up a lot of time on our previous two attempts and this was the easiest place to do it. I had forgotten how rough the start was though, and we were barely averaging the right speed, before we suddenly got an 8:11! I wanted to panic and push on and tow hard, but I remembered the plan, and to do so was not in the plan where the ground was more difficult. We had also accumulated several minutes in the stages immediately preceding this, so we had some ‘in hand’. I waited until we got to the wide track and then went for it. I was pretending I was out for a long steady training run. I tried to relax, to run tall and look ahead, to use my arms and to trick my mind into thinking I had just stepped out of the door and really hadn’t been racing for 8h at all. As my watched beeped and the km ticked over I was feeling good – now we were comfortably going under 6:00 / km! The roads go on and on but it was drizzling with rain and nice and cool. This was easier than in scorching sunshine. We ran fast in our suits which have very thin and flexible legs. I remembered to eat, feeling like I was going overboard but knowing I really wasn’t. It made such a difference, I kept my head and did not feel like having a little sit down! With two or three km to go I felt that the tension in the tow cord was getting stronger and more persistent. We hadn’t been talking much as there was no need and it was better to concentrate on what we were doing and where we were putting our feet. I silently willed Izzy to keep going and told her how far it was. She didn’t quite believe me, because this run is a little shorter than advertised, so you have to trust experience! It was true though, and we were so delighted to finally get to a swim, chattering excitedly to the marshals. We remembered these sections as a series of short, easy and refreshing swims with some fiddly running in between. The marshals told us to look at the current – it was like a river running left to right. The coast jutted out to our left, so I followed it as far as possible before launching ourselves across. It was hard work but not too bad in the end. I was happy my arms did not feel as tired as they had before we did the long run! We approached the next swim – 350m. There was no marshal but we could see the current again. It looked so strong and this time there was no protection. I hesitated, not wanting to get in. We looked across and I decided to aim for a small hut to the left of the flag. 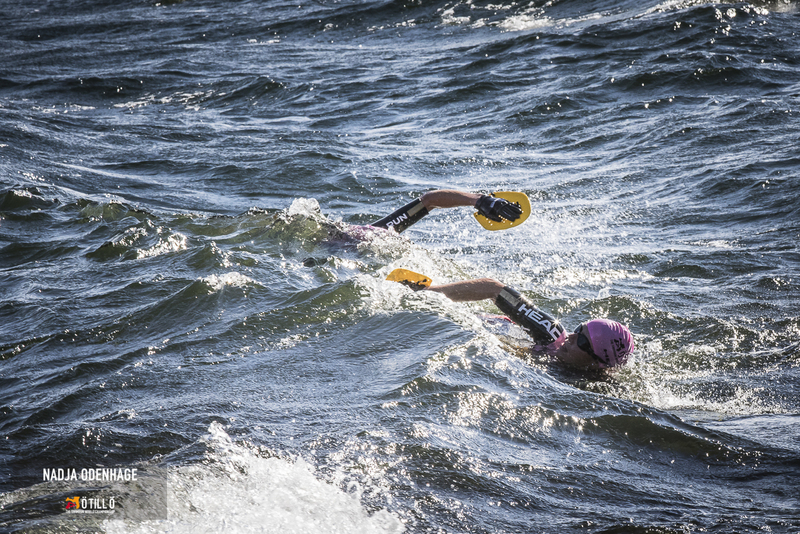 The swim seemed to start well, and I sighted often to make sure we were still on track. Suddenly, about 50m from shore, the current accelerated and seemed to catch us without warning. We were sliding to the right at high speed! I pulled with all my might and could feel the tow going tight behind me. I was picturing Izzy swinging away from me in the current. We passed the flag where we needed to land and the adrenaline was coursing through me. As I breathed to the right I could see the island does stick out a little – I thought if we could just get in line with those rocks then if we got pulled along we should hit them – if we didn’t get washed around instead! I didn’t want to find out and in my haste started to kick my legs. It might have been counter-productive as then my pull buoy popped out and was bobbing next to me – still attached but ineffective and in the way. I could see the bottom but couldn’t reach it. Izzy told me she tried to put her feet down and failed. There was someone standing on shore but I didn’t pause to look if he had instructions. 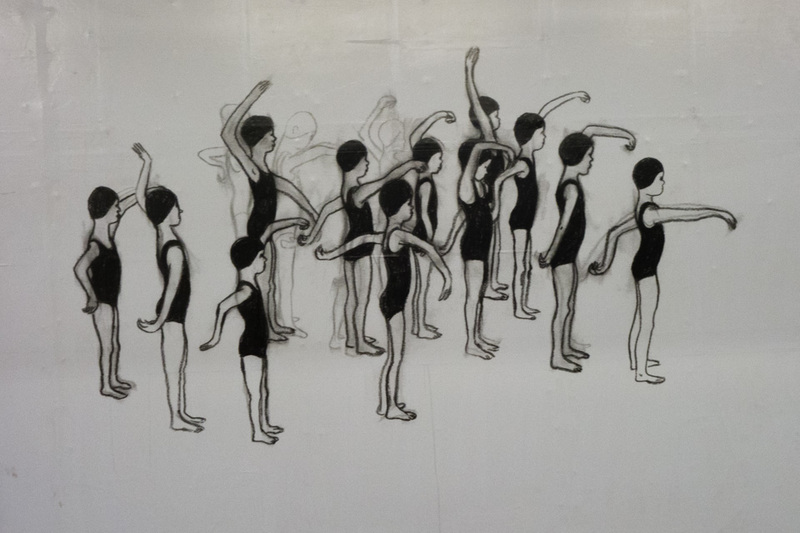 I daren’t stop throwing my arms over, knowing that as soon as I did we’d be pulled away from where we needed to be without any chance of swimming against the current. With a super human crazy strength I finally got close enough to grab the rocks with my hands. I hauled myself up, and helped Izzy behind me. Oh my goodness! What a total relief. The marshal was full of praise and admiration as he ran along to show us the way. There was no time to stop, but I was jabbering to Izzy. I am not easily scared but that was SCARY. What happened to straightforward finishing swims?! I feared what might come now between us and the final run. They are all less than 200m, but still … at one swim we couldn’t read the water and when we got in we could see the bottom but were not moving anywhere. Finally they were over, and we double, triple checked with the marshal. YES this is now the final run! We got up and over and went for it. We put in a sub-5 min km as we smashed it. Only one ‘Porty parkrun lap’ to go. The final road climb came suddenly. Someone walking back said ‘you are 4’ … eh? ‘Yeah, we’re number 404’, I think to myself. We worked and worked. We nearly caught the male team in front with our sprint finish and I could hardly breathe. Not quite 30 minutes faster than last year, but 28:15. Final time 11:18. Result! Michael Lemmel is ready with the hugs and tells us we’re 4th females. Whaaat?!! We cannot believe it and are super, super happy. We were so early we managed to get changed, eat, drink beer (Izzy) and still make it to prize giving. Just time to buy a t-shirt and go through all the facebook notifications – it had been going wild with friends back home tracking our progress! Results here. We were 15 minutes away from 3rd – close enough to feel we were not miles off the pace, but far enough to know it was not just out of grasp! In fact, we lost all that time in the first 4h and then held the gap. The weather helped us – when the wind was roaring in our ears it felt just like a jaunt down at Gullane. Some other fast teams did not start, or had to pull out due to injuries or sickness. But it didn’t stop us being over the moon. For me, this was a remarkable case of following a plan and getting our minds in order. It is so much better to race this way, to both be on the same page and to maximise performance. It’s nice to go to races now and know quite a few people. Special mention to Cat and Jenny who did finish. Even more remarkable when I found out that Cat had never swum more than a mile nor in the sea before… not really recommended but she had a fantastic attitude and trusted in her partner. Her report here. Scott, for coaching and making sure I don’t go too ‘bonkers’, like him. Grace, whose nutrition analysis was spot on and helped me get to the start line 4 kg lighter than last year. Ellie, for her amazing pilates classes that help my strength and balance. Alan for stroke analysis to help me swim faster, or at the very least, more efficiently. Staff at Physis for keeping my body together, especially Rachel for massage and Graham for physio – I know I can rely on you. Andy, for putting up with all my training and away weekends. Izzy, for getting it together and racing her heart out on the big day. And of course race directors Michael and Mats, all the volunteers and our sponsors sportextremeswimrun.com for suits and goggles and Gococo for socks. I am getting very behind with my race reports, and the races are coming thick and fast! I had a busy summer planned, including throwing in a triathlon (more on that in a later report). 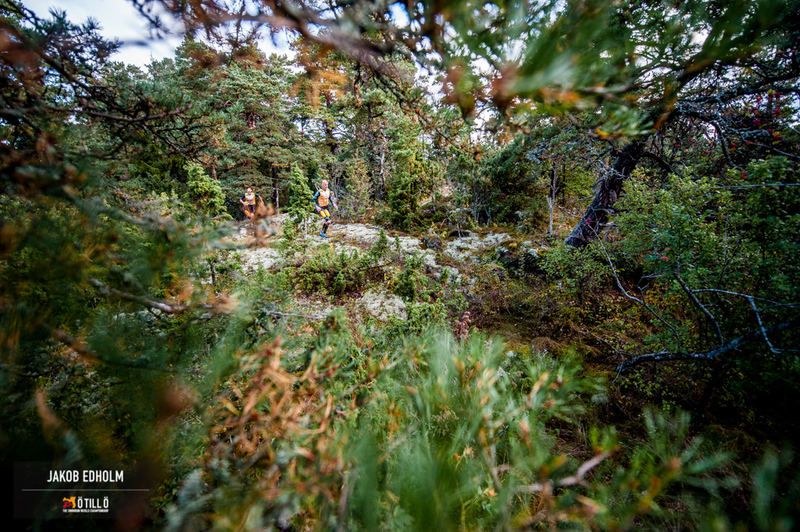 In an effort to get 6 counting races for our swimrun ranking, Izzy and I entered Borås swimrun (near Gothenburg in Sweden) even though it was only one week before Isles of Scilly. We later discovered that the 6 races could be over two years – but by then it was too late! 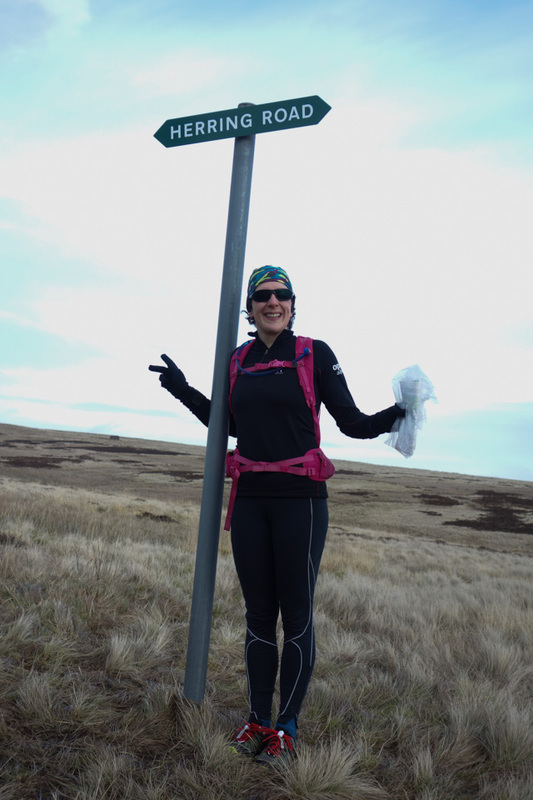 I was quite excited to be going back to the scene of our first ever swimrun. I wanted to see how it would feel now that we have two years of experience and training behind us, instead of cutting our wetsuits and practicing transition routine the night before! We also had the advantage that Izzy hadn’t been sick and not eating the week before. 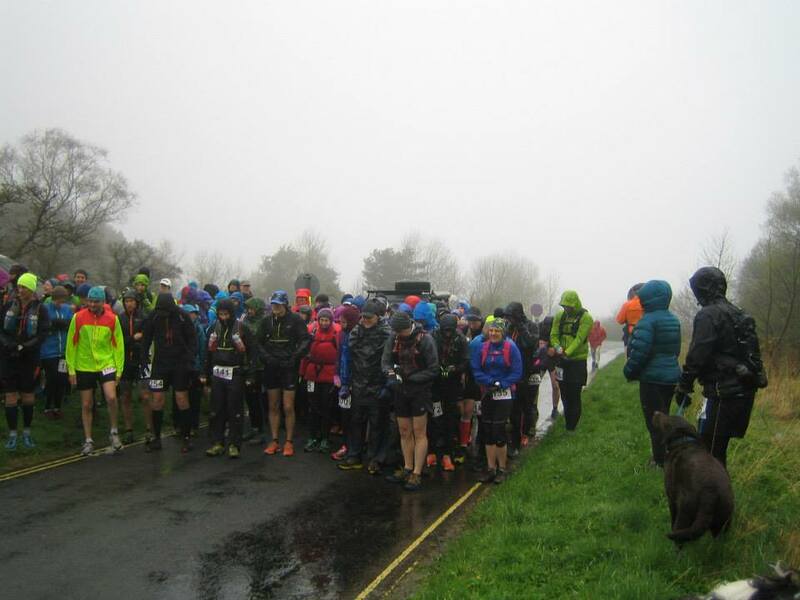 The day got off on slightly the wrong foot; when we registered we were handed one buff between us and were told to share … a slight that was keenly felt when the male / mixed teams all seemed to have one each! We got changed and were nearly ready to go, though Izzy seemed a bit distracted trying to program the car gps to get her back to the airport after the race. She had to whizz off a day early to get back for a big work thing and was going to miss her in-car navigator (i.e. me)! The race starts with a steep uphill through the woods. Last time we really backed off here, but had a plan to start a bit more confidently. However, Izzy slipped on a rock, saved it, but I was having to keep pausing. I didn’t feel like I was going fast, but with the adrenaline of a race situation it can be hard to judge. I let her run in front a bit to set the pace and soon enough we leapt into the murky first swim. Something wasn’t quite right as Izzy wasn’t on top of my toes and on the exit she shouted we had to slow or go on tow. This was the technical tricky bit of the course though, so I just pegged it back until we got down. Still doing OK this close to the start! The next couple of swims and runs we seemed to settle down, until it was off up the side of the hill again. I was pulling hard but I am not sure Izzy was really appreciating the sentiment!! However, as we headed down again and across the lake with the first of three longer swims, things got back to ‘normal’. We would run with a little group, lose them on a swim, find a new group and so on. The long swim across the end of the lake went much more smoothly than last time, with only a minor detour to avoid the spiky reeds at the end. I think I did a better of job of sighting – ignoring the house and instead picking some slight feature on the horizon. Creatures wading out through undergrowth, totally normal.. The river swim was still exceedingly jungle-like, now with added crocodiles, whales and other assorted out-of-place creatures. I got hit on the head by a floating stick, we had to doggy paddle under fallen trees and pause to check which way to go round the various obstacles. As we exited, hauling ourselves up a rope, I was feeling the pressure on my bladder and only now finally managed to let go a pee… how bizarre that even when swimming around in water for so long you can get so bursting! The long run was upon us and it was raining. 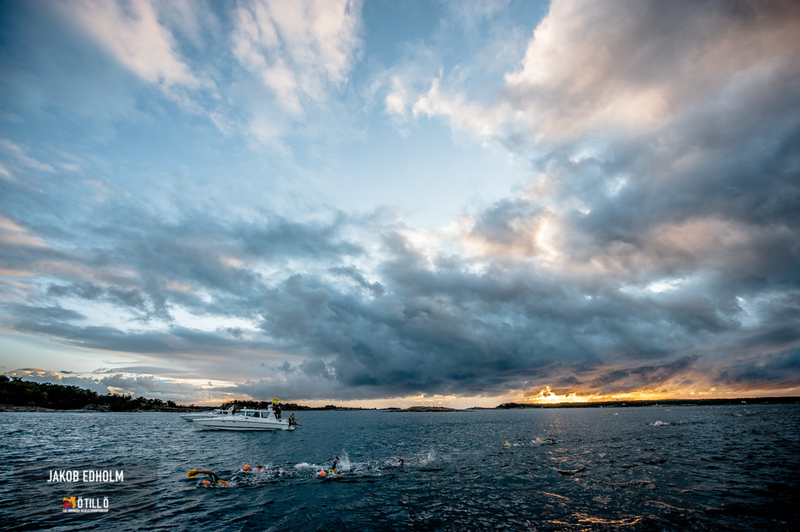 It occurred to me that this was quite a rare experience for us in swimrun, though we barely noticed and it was quite welcome relief. At some point along here, we glimpsed a couple of female teams up ahead. We could only see them because we were now moving faster than them, but it was a bit of added pressure. Every swim we’d catch them a bit, then they’d maintain or pull away on the run. But then it was some final swims and we were flying. We overtook one team and were catching another – just on their heels at the final exit. But they jumped out and raced up to the arch, with us a few seconds behind. Final position was 5th females, which was a disappointment as we had been targeting the podium. Indeed, looking at the splits our second half was easily second fastest, but we had too much to do to make up for earlier mishaps. We just needed the race to be a couple of hours longer! 😀 Results here. Pre race, at least we both started smiling! And in our case, we had the Isles of Scilly swimrun coming up just one week later! Ah … post race ‘relief’! After months of preparation we were on the start line for Ötillö at 6am in the gloom of early morning light. We’d already had two nights of ‘feels like we hardly slept at all’, experiencing an almighty thunderstorm back in Stockholm and an early start and nerves on Sandhamn. In our 3 days in Stockholm we had eaten enough to sink two battleships, had a delightful costume-only swim in a lake, kicked back in a sauna, gone for a 5km jog, contorted ourselves on a portable foam roller and met up with friends who popped over from Finland. We had left strange piles of empty beetroot juice bottles by the bins and scribbled all over my hand paddles. We were ready. As several mixed couples had a pre-start kiss I felt left out … so I got a cheek-to-cheek and air kiss from Izzy! Then we were off. After running in silence for a minute or two Izzy said: “Thanks for doing this with me. I thought I should say it now in case I feel differently later”. I was equally grateful to be racing with her and couldn’t believe our moment was finally here. As we got to the beach we looked across the expanse of sea to the next island. 1.7km, just over a mile. There was a strobe light, but as soon as we got in, I lost sight of it and just aimed for a suitable looking bit of land. We had plenty of other racers around us and were overtaking those who had set off fast. I got disorientated part way over, seeing rocks on the seabed below us. How was it so shallow in the middle?! The first time I got a taste of the water I was pleasantly surprised. It was almost like a salty sports hydration drink, and did not induce the sort of sounds that we get from North Sea mouthfuls (think; cat with a fur ball in its throat). As soon as we got out we were in for a shock. It doesn’t matter how many photos you look at, how many videos you watch or how many people you speak to who have been there before. You can’t know how the terrain really is until you experience it. Slabs of wet, slippery rock and boulders. I am not the most sure-footed and Izzy felt worse. Our practice attempts at uneven get-ins and outs were no match for this! Team after team streamed past us. I tried to stay calm and kept moving until the next short swim, when I slipped forwards. I could feel myself going and did a ‘superman’ move to distribute the impact, bashing my knee hard and scuffing my palms. Someone helped me up and we jumped right in the water. I felt a bit shaky and my knee was sore. I imagined I had cracked my knee cap, until I realised that was probably ridiculous and I had better just get on with the job in hand. Some time later we had just 4.5km run to get to the first checkpoint. I checked the scribbles: we were well off our target pace. But, hang on! I suddenly realised we were cutting it fine to even make the cut-off, something I had not anticipated at all. We had 35 minutes, no problem for a normal run, but we had no idea what the terrain would be like and we had already been on the move for 2.5 hours. There was no way we could allow ourselves to go out of this race, let alone at 9am. Soon we were breathing heavily and finding it hard to talk. When I asked Izzy to check our pace on her gps watch we were under 5 minutes / km. Panic spurred us on and we fell into transition with 14 minutes to spare. Little did we know it, but we were almost at the back of the field, with only about 15 teams behind. From that point on I kept an eagle eye on the time cut offs. I knew we had to build more of a buffer. The effort had taken a lot out of us and we were using the tow. I was worried because I knew I couldn’t pull for the long 20km run to come. Izzy later said she had been feeling low as well, demoralised by our difficulties on the rocks. Although the first swim had felt fairly tame, things were going to get more interesting. 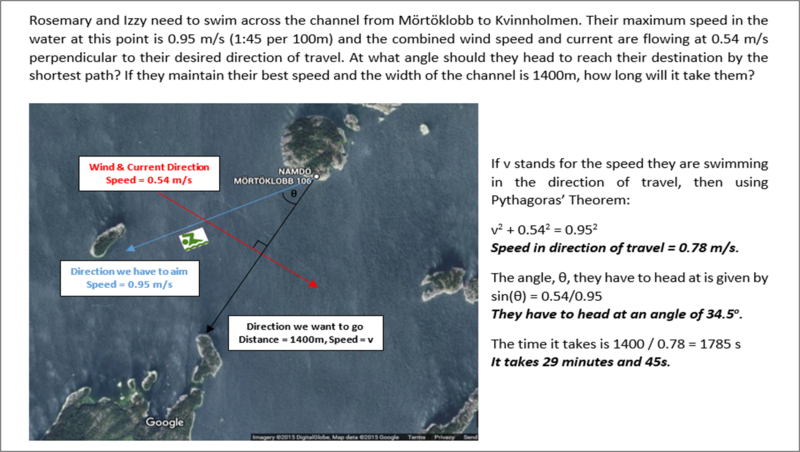 Several of the crossings had strong crosswinds, currents and waves. I am sure if I had been on holiday and stood on the rocks looking out to sea I’d have decided it wasn’t possible (or safe) to swim. But here we were, clambering in and setting off towards another elusive strobe light. We already knew that small-looking waves on land can seem huge when you’re in them with just your head above water. But these appeared quite big to start with! A few times I’d turn to breathe and almost roll over, getting a wave right over my mouth and missing a breath. It felt dangerous and it felt exhilarating. Most of the time we were strong and effective and knew we were passing or leaving teams behind on each swim. I did have one aiming glitch, when we came the wrong way round a rocky outcrop and got grounded in shallow water. After one swim I felt tired, so we swapped the lead for the next – and I apologise to Izzy for my inability to follow properly! The second cut off came and went and now we started making good time, moving at the pace we had hoped to go at from the start. We still only had 31 minutes in hand though. We tried to be efficient in feed stations, stopping to drink two or three cups of water or energy drink and picking up food to eat whilst we walked out and kept moving. The infamous ‘pig swim’ loomed large. I almost wished no-one had told us anything about this difficult swim! But in the briefing we were informed some people might take an hour over it. Really? For 1400m? At any rate, I was determined this would not be us and set my stop watch as we got in. We emerged smiling and triumphant on the other side after 29 minutes of swimming. My swimming mojo had returned 🙂 . We had spectators here, cheering and handing us a Twix bar. Izzy asked me something but I could only say “I’m trying to climb up these rocks, eat a Twix and do a wee all at the same time … but I will answer when at least one of those things is finished with!” We passed through the third cut off with 61 minutes to spare. The next section of the race is a bit of a haze. I am not sure what happened, but we slowed down somewhat. My knee was sore from both the fall and the slight injury I was carrying from an adventure race in Ireland 5 weeks earlier. We were tiring of the hard conditions underfoot. We were also moving inexorably closer towards the 20km run section, which I was more afraid of than the pig swim. The result was that we had to run each km in at least 8 minutes. I decided to set my stopwatch and ask for a distance check every 8 minutes. All very well in theory, though by the time we were getting to 12 x 8 and beyond, the maths was making my head hurt. Not to worry; it was a great distraction. After 8 minutes we’d done 1.3km. After 16, 2.5km. Then a tricky section where we only covered 1km in the time slot. Soon we were back on wide tracks and asphalt roads. The km ticked by and we gained 200-300m every 8 minutes. We rewarded ourselves with a pack of Honey Stingers (pomegranate) halfway to the first feed station. We passed through someone’s back garden and a lady with a team list shouted “Go Rosemary! Rule Britannia!” – now that’s dedicated supporting! Small children sat on the verges shouting “Heja! Heja!” and our feet fell into the rhythm of their chants. As we stuck to our own pace, we steadily passed teams. 10 of them, in fact. I’m sure I saw a snake as we tripped along, but Izzy was beyond caring (unless it ate her, in which case, she stated, she’d be pleased it had ended the run). Enthusiasm was dipping somewhat but we pushed on, maintaining an average speed of 6:09/km, which I was pretty pleased with considering we were already nearly 50km in to this race at the start of it! To Izzy’s displeasure I insisted we wriggled back into our wetsuits before the start of the next swim, on a section that had us walking anyway. And soon we were back at the sea, the final cut off, 39 minutes to spare. After a moment where I celebrated and Izzy greeted a playful dog, we just had the final section to go. We were going to do this thing. A bit of running, a bit of swimming. The trouble was that we no longer trusted our legs. They were wobbly on the uneven stones and refused to work as we hauled ourselves out of each swim. The transitions we’d practised so often were getting slower and more fiddly and no sooner had we got our legs working on the ‘runs’ (walks?) it was time to swim again. Finding the route, watching for the colourful marker strips in the trees that had shown the way like a dance all day. Sometimes we couldn’t see them even as they were right in front of our eyes. Our pace had dropped again. Perhaps without the focus of the cut offs our minds were less strong to will our tired bodies on. At last we started the final 3.2km run. We forced ourselves to ignore our screaming muscles and run properly. As we looked up ahead I remarked “oh, a phalanx of teams”. We drew closer and saw that Pippa Middleton (celebrity sister of Kate Middleton, royal, in case you’re not up with these things … ) was amongst them. Our friends had urged us to make sure we beat her, and I admit we were surprised she had still been in front of us! We might have sped up somewhat as we gunned for the line. 1.5km more and we were faced with a cruel uphill finish. Then we were there. We celebrated, we moved forwards, I collapsed onto a bench and started crying from all the emotion. We had actually made it! We had (as is my wont) under-estimated the difficulty of the undertaking. We had our highs and lows, times when we felt weary and wondered how we’d ever finish in time, and times when we were high on the craziness of what we were doing. Now we had done it. We had finished a World Championship race and we were proud. I won’t lie. The week after has been tough … talk about post-race blues! The body and joints are tired and achey, my knee hurts and my emotional state is unpredictable at best 😉 . The thoughts of ‘we could have done better’ are creeping in, and we have moved from ‘not next year’ to ‘maybe next year, if we could get in again’. We both want to conquer those slippery rocks that drained us of so much physical and mental energy and time at the start! Izzy is emphatic that it is the toughest thing she has ever done (despite several Ironmans and Celtman under her belt). I probably agree: multi-day adventure races are a test of sleep deprivation and endurance but the intensity is much lower. I still keep reminding myself that only 1 in 4 people who want to do this race are selected to start. We swam 10km and ran 65km in one day. Two things I have never achieved before. I will hold onto those facts, even though they seem unreal 🙂 . Many thanks to our sponsors and supporters for this race: Head (wetsuit and goggles) Gococo socks (blister free compression heaven) and BeetIt (nitrate power). It has been pointed out I should thank my long-suffering colleagues, friends, family and boyfriend for putting up with almost a year of Ötillö chat, trials and tribulations. Also my coach, Scott, for his sage advice. And finally, my straight-talking physio Graham, who has endless patience, a cheeky sense of humour and without whom I might not have even made it to the start line. Now all we need to do is recover enough to do it all over again at Loch Gu Loch – a Scottish equivalent based around Loch Ness, but slightly shorter. Then I can get my bike back out and slide gracefully into winter racing. Fighting through some reeds near the end! My poor knee / limited edition socks! This bit was easy. Izzy and I are racing at Ötillö in September and we needed to practice! 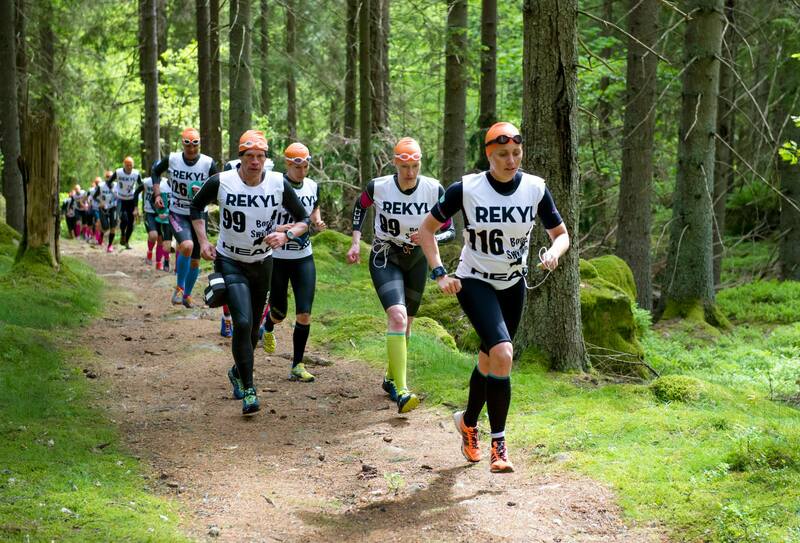 We chose Borås swimrun, to the east of Gothenburg. It fitted our schedule, was relatively cheap and easy to get to and a good first race distance to try. The format was similar, but instead of swimming between and running across islands, we swam in little pools, zig-zagged across a large lake and ran up a lot of hills. 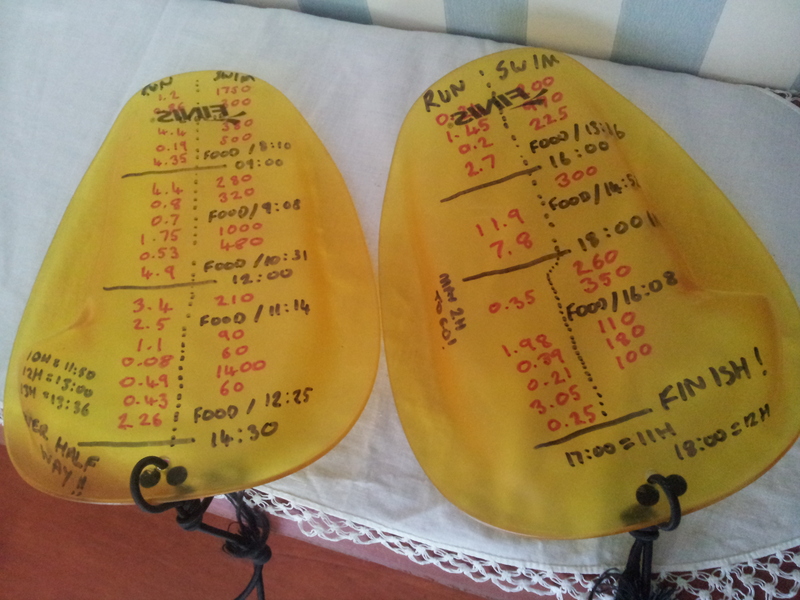 Overall, 14 runs totalling 29km and 13 swims totalling 5km. A view down the length of Öresjö. Looks a long way! Well, we didn’t use the website because a friend at my Italian class had told us all about airbnb. I’d never heard of it before, but after a quick search, we were booked in to stay with the lovely Peter and Monica just outside town. More on their generous hosting later, but this worked out really well for us. Almost everyone at Ötillö chops the arms and legs off their wetsuits. This makes it easier to run, reduces the risk of chaffing your bendy bits (backs of knees, insides of elbows) and means you can easily pull your wetsuit off your upper body to run if you want to. Despite laughing when I read a race report from last year, where the competitor had chopped their wetsuit at the start line, we found ourselves with this job still to do on Saturday! One of the advantages of staying with a family was we could ask to borrow scissors. Even better, Monica works with textiles and is a designer, so we got a proper pair to use! We had hired a car so it was easy to drive out to the race area in the afternoon and have a look around. 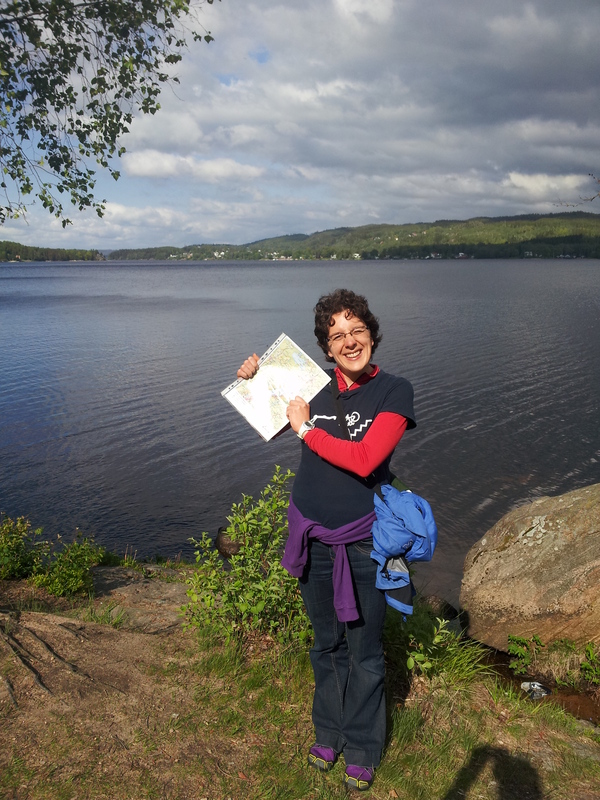 We went on a little walk round some of the course, and I studied the maps. It was all becoming clear what we had to do, though looking down the lake and knowing we would be right at the far end, out of sight, was a bit daunting! 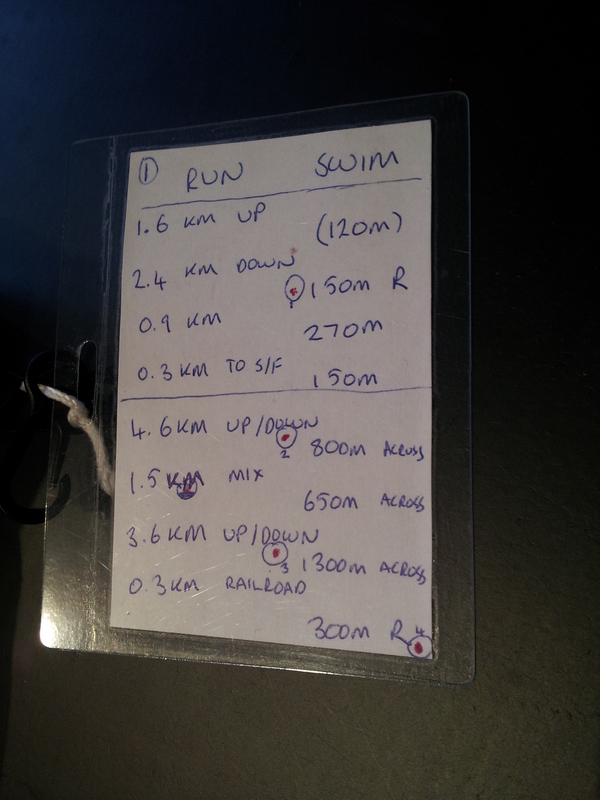 I also wrote all the route stages on a small piece of paper and laminated it in an unused membership card holder. After I had done that and looked at the map many times, I had the route firmly ‘tattooed’ onto my mind! We could feel the wind buffeting the car on the way to the start on Sunday morning. But when we arrived the lake (Öresjö) looked fairly calm. I mused that perhaps further down, it would be less sheltered and the wind would have got some waves up. I wish I’d been wrong! The water hadn’t warmed up as much as the organisers had hoped, so the long swim at the end had been shortened. We did still have to do 5km in total, with one leg of 1.3km. The water was about 11ºC. Cold, but not unlike our training conditions. 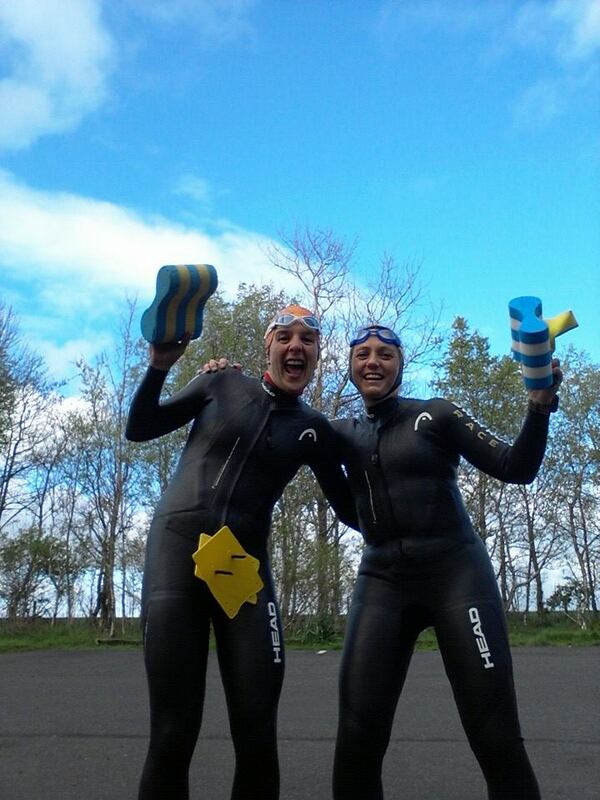 Unfortunately, we hadn’t yet swum in a wetsuit with missing bits, but there was nothing we could do about that now! With about 10 minutes to go we were standing in all our kit ready to go and listening to the briefing. I was looking at everyone else’s clothing and kit choices, to see what we could learn. Suddenly I noticed timing chips on people’s ankles. Argh! Where was ours?! Izzy sprinted back to the car to retrieve it just in time! Then we were on the start line. Izzy suddenly said to me ‘Don’t go charging off at the start!’ I looked at her, surprised. ‘But I thought that’s exactly what we’d agreed to do, to avoid the queue on the hill?’. ‘I’ve changed my mind’ she said, and I could tell from the look of panic on her face that I’d better listen! So we ran to the hill at a steady pace and walked up. It was really not a bad strategy, as for the next hour or so we just steadily caught and passed team after team. We didn’t need to ‘burn our matches’ so early in such a long race. The middle section of the race was one of the hardest. 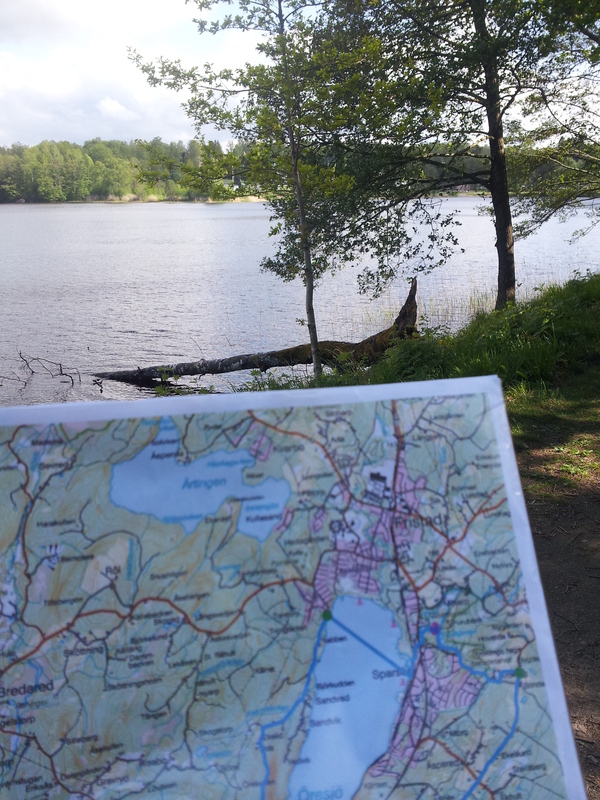 After a number of shorter runs and swims, we had our first big crossing of Öresjö. We were swimming well, despite the waves hitting us from the right. I seemed less thirsty after the three big swims, probably due to the amount of lake I accidentally swallowed! This won’t be so convenient in the sea water of Ötillö. We overtook a lot of people here, but at one point I started to feel cold and irrationally panicky. I reminded myself of the race briefing: ‘if you get cold, keep swimming!’. I was very relieved to make land on the other side. I think we were being filmed as I shouted ‘we made it!’. A short run round a hill and we were heading back across the lake. It didn’t seem so bad the second time. We were racing using a bungee tow cord. 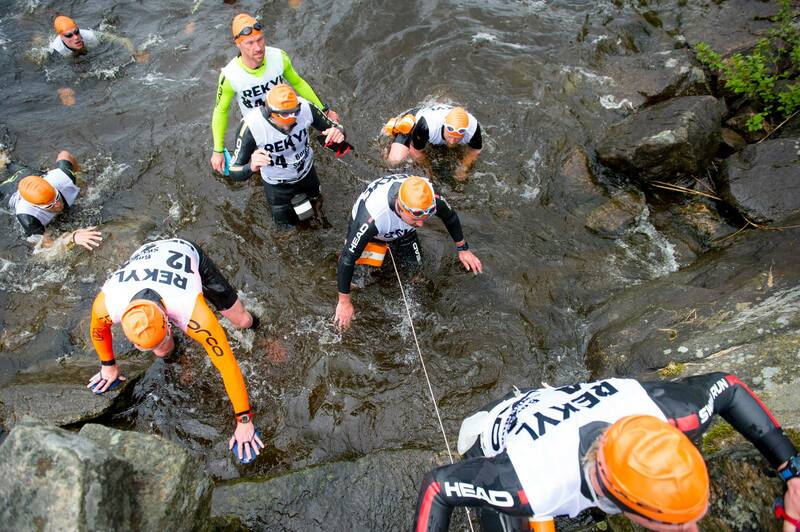 This is quite standard in adventure racing but a strange concept to many triathletes. In the water, it kept us close together. When it was busy, it meant we didn’t lose each other. When we had to cross wide expanses of open water, with the wind whipping up waves and creating white horses it was reassuring for me to know Izzy was never more than 3m away. Practically speaking, by removing the need to keep checking on where we each were meant one less thing to think about. This was significant when also trying to breathe, sight and swim fast enough to stay warm! We did learn it was easy to get tangled up in a bungee when getting out though – something we’re already thinking about how to fix! The second use is on land, if one of the pair is feeling stronger than the other. I was towing Izzy behind me, feeling the tug on the cord as I gave a helping hand. A race like this is all about teamwork and getting to the finish line as quickly as possible – but still together! Anything that sounds cheerful, enthusiastic or welcoming Hej hej! Anything preceding the offer of food or water, or showing the way Tack! Anything that sounds like important information OK! It was funny when we’d get into the water and Izzy would ask me ‘did you get all that?’. I’d say ‘um, swim to the red flag?’ … I wondered what else there was to say. Perhaps, watch out for killer piranhas? After running up and down another hill it was time for the longest swim, of 1.3km. The house and garden we were aiming for looked obvious when we started. But soon we seemed to lose sight of other competitors, and sometimes I couldn’t see where we had to go. Each time I sighted, I might see the house we were aiming for, or I might get a view of nondescript land or a wave instead! Halfway over I felt a bit alone and had to stop to double check we were going the right way. We were. My pullbuoy kept working its way down my leg, which was annoying. At last we could see the landing flag clearly, but there were reeds between us and it. We tried to swim through but they were sharp and unyielding! How frustrating. We had to detour upwind to get round them. Other swimmers came in higher than us and were fine. If there’s a next time I’ll remember this! Then we hit another patch. They looked smaller this time and we wanted this swim to be over. I could feel my buttocks shaking, whether from cold or tension, I wasn’t sure. We just barged through this time, getting scratches on face, arms and legs. Izzy, who was behind me, seemed to emerge less scathed – perhaps my paddles had hacked a path through! We were out, running, but soon back to a river. We got some more unintelligible instructions, but it turns out these ones might have been important. I just got in and started going upriver. I’d told Izzy this was a short swim, and distance-wise, it was. But the current was strong, and the water tasted funny. We kept hitting logs beneath the surface and I saw some people resting at the sides. It was taking forever to get anywhere and I was desperately looking for the exit round every bend. Soon enough, up ahead I could see fallen trees blocking the way, and a clutch of other racers. I paused to tread water and see what was going on, but was getting dragged backwards! This was quite scary, so I powered forward and caught onto a log. It moved and I had to let go as it floated away. Then I grabbed another and hung on, feeling my legs pulling away from me downstream until Izzy was there too and we could talk. Everyone was getting out, so we followed them and made our way along the shore briefly before jumping back in for a short stretch. Suddenly we were at an aid station and a timing mat. There were loads of people shouting and cheering. I felt dazed and slightly traumatised!! As we approached aid stations we’d check what we doing. Were we stopping, and what for? This way we could coordinate and move on quickly without getting annoyed with each other or wasting time. We did carry some food and water and were testing how well this worked. 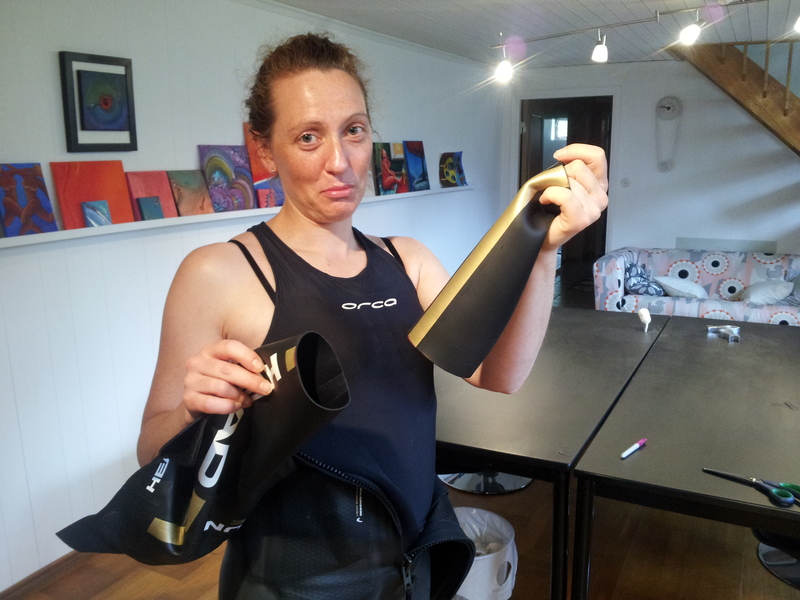 We learnt: soft bottles down a wetsuit leg can easily work their way out. A hard bottle in a flipbelt stays put but is slightly awkward to get in and out. Pockets on the backs of jerseys are hard to use. Pockets in the fronts of wetsuits are easy to use. I was surprised how difficult it all was. Stuart, a former Ötillö racer, had warmed us that the constant in and out of cold water and change of activity was hard, and he was right. Throughout the race, there was so much to think about. Keeping track of the stages, knowing when a swim was coming up and preparing to transition, planning around aid stations and sighting on the swims. All this will have taken energy and added to the physical demands of constantly getting cold and having to warm up again. It was definitely not the same as swimming 5km then running 29km! On we pressed. This is the first time Izzy and I have raced together. I was looking for clues about how she was feeling; in footfall, breathing, talking and the amount of pull on the tow rope. As we moved along the longest run sections, I could tell she was finding it hard as well. Even so, we were still steadily catching and passing quite a few male pairs. Despite how we felt, the results show that we were strong in the section after the timing mat, making up ground on (though not catching) the team in front of us, and moving away from the team behind us. A random short swim across a pond and back was actually a relief, despite us forgetting to zip up our suits. I knew the end was in sight from here, and kept pulling Izzy along and trying to crack jokes. I think I managed one or two laughs, though my ‘chariots of fire’ rendition near the end may have left something to be desired! We had absolutely no idea where we stood in the placings. It’s possible that some of the excited cheering was telling us something, but we didn’t know. Even if we’d kept track at the start it would be impossible to see who was passing who on the swims. About an hour before the end, I thought I’d seen a girl climbing out in front of us, but wasn’t sure. I knew in any case that we were going as hard as we could, and that what seems close in the water can be much further on land. I decided to minimise potential stress and kept quiet. As we finished, we got a hug and medal from the race director. Then he told us ‘you are 3rd female team!’. We were ecstatic and hugged each other and jumped up and down and hugged him again, even though we were wet. In fact, the 2nd placed girls had been just two minutes in front and had known we were behind, so had felt the pressure! 1st place were a long way ahead. We were 15th overall out of 80 finishers, though several teams had to withdraw due to the cold and plenty of others appeared not to start at all. Full results here. We were delighted. This was our first ever swimrun, our first race as a team and we did it off the back of a bad week for Izzy. We also learnt so much that will help us in September. Right now the thought of doing double that distance is daunting, but at least we are prepared! “We’re vegetarian. Do you have anything?”. Er … No thanks, maybe we’ll just go and buy a cake and drink tea out of a glass before heading into town for a giant Thai tofu curry! We got home tired but satisfied. Peter and Monica had put the sauna on and we were soon indulging in ‘therapeutic’ heat treatment. Something we’d have never got elsewhere! Many thanks to our sponsors and supporters. Especially Head, whose wetsuit was invaluable and designed for the job. Also BeetIt for giving us the best start and Chia Charge for on the move nutrition and post-race protein bar. Next time we should also be wearing Gococo compression socks – more on those later! Third. Come back and do it all again next year! It took until Monday morning to find a good bun cafe. Too long. 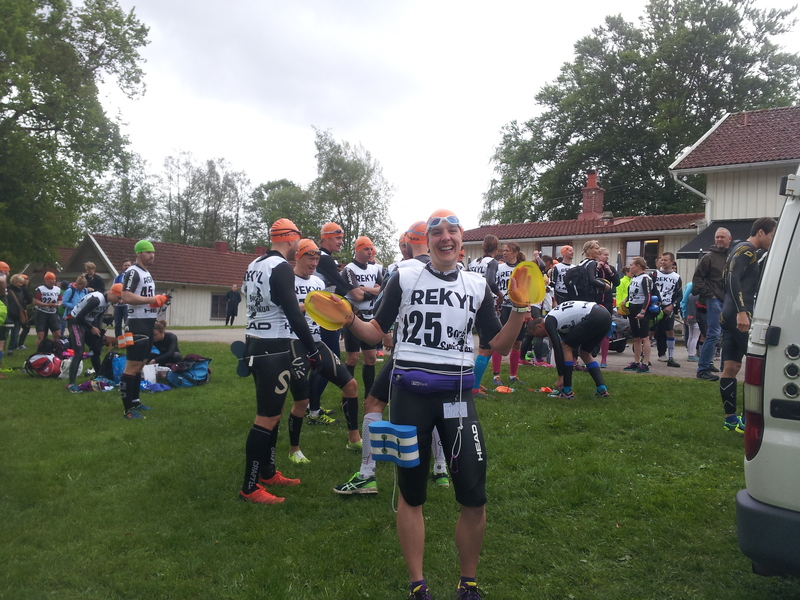 More about Ötillö – this year’s Big Race! 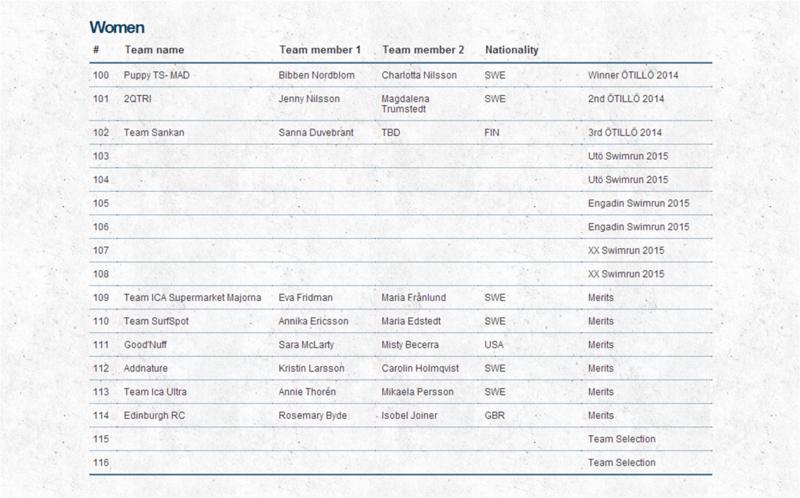 So, it’s been some time since I got over excited in the office about getting to race Ötillö this year. You can read more about it here. Every year, in about October or November, I start thinking about what my ‘big race next year’ might be. In 2012 it was Celtman. I devoted 2013 to triathlon, particularly the Scottish middle distance championships. In 2014 it was all about Itera. 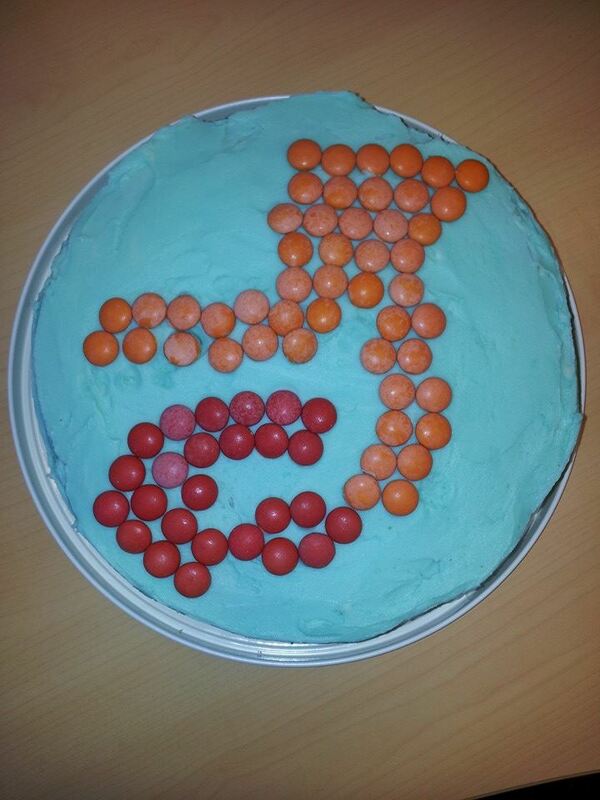 Training tip 1: persuade your friends to make you an Ötillö cake. I like to have something to work towards, something that I might not be able to achieve tomorrow, or next month, but that is doable in 9 months’ time. I also like endurance races, something quirky and not too mainstream. So, at the end of last year my eye alighted on Ötillö. I’ve looked at this race several times before and decided it wasn’t for me due to the ‘excessive’ amount of running (65km in total). However, the effect a couple of expedition length adventure races can have on you is that what before were seemingly daunting distances provoke a reaction akin to ‘oh, only …?’. I also got inspired by an episode of the Adventure Show (an ace BBC2 Scotland programme, which airs sort-of monthly, following adventurous races and other goings on!). There was a segment on two chaps running up and down mountains, looking free and comfortable. I wanted to be like them and thought why can’t I run further?? And so the wish was born. With a lack of other options grabbing my eye, I set about finding a race partner. This was easier said than done. I encountered a variety of reasons for being turned down, ranging from being a teacher and having to work on a Monday, being too busy studying for exams, concern over getting too cold in the water, expecting a baby, not being able to swim and plain old ‘don’t have time to train for that’. I was also ideally looking for someone who I knew, located somewhere nearby (ish) and of a similar ability to me in both swim and run. I didn’t want big mismatches in either discipline as I thought it could become frustrating. Eventually, as I almost gave up hope, I found Izzy … so close to home I couldn’t believe I didn’t think of her earlier! She’s even in the same club as me and we had a close race at the inaugural Celtman. Even better, she said ‘yes!’ and the race was on to get our application submitted. Since then I have been training! Lots of running. If you’ve been reading my blog, you’ll know I had problems with my hip back in October. After several physio sessions and some determined doing-of-prescribed-exercises, I have been going from strength to strength – pun intended! Whereas the last few years I managed to race on about 20-25km a week, if I was lucky, I can now squeeze in 50km a week and I’m going faster. I find myself wondering since when did running become a valid form of transport? I run to work, the pool and even friend’s houses (“hello, how are you, may I use your shower?”). Swim training has been interesting. I have found that I can now keep up with the front guys in my lane and go faster than I have for many years. I suspect that I have not got physically better, but that there are strong psychological factors at play. I know I need to swim harder, there is a reason to get better at it, and I therefore believe I need to / can have a go at keeping up with them. 10km of swimming is a rather different prospect to a 1.5km triathlon bimble 😀 . There have been other things to think about too. Like getting to know Izzy better (we’d only really spoken a handful of times before), reading up about the race and getting kit sorted. In this regard, we’re delighted to announce that Head Swimming are sponsoring us! 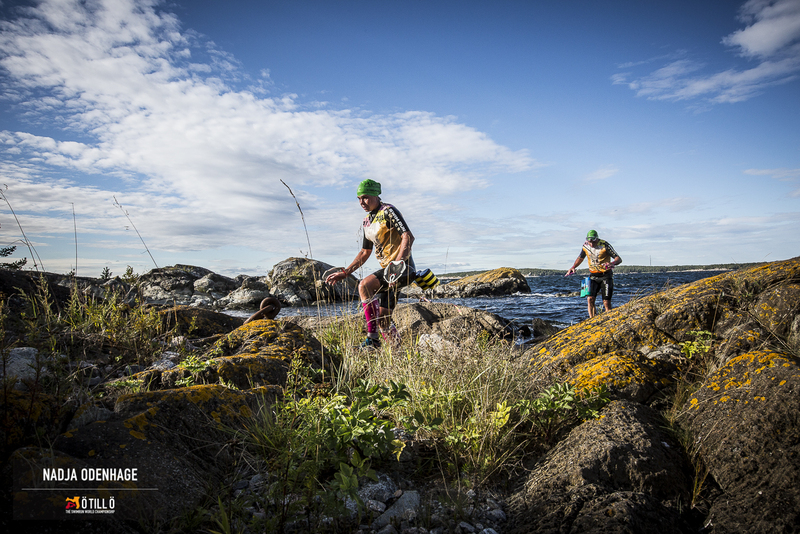 They are the only company to offer a full line up of swimrun specific wetsuits. This sport is really popular in Nordic countries, where the brand already has a strong following. We are lucky to be able to train and race in a top of the range suit, so we’ll have no excuses there! If you’re doing any swimrun events and want to know more about what to look out for, just ask. More on that later, with a wetsuit review to come 🙂 . We’ve also started experimenting with paddles, pull buoys and run tows. We have two great options for open water swimming nearby, but the water has barely warmed up enough to get in (for me, at least!). We braved it twice last week, and are getting used to swimming in shoes and running in a wetsuit. I like to build my race season to support my big target event. The trail race at the start of this month was a great test of my running legs. Next up is a 5km swimming race. I’m not worried about going the distance, even though this will be the furthest I’ve swum for many years. Rather, I’m keen to feel strong and fast! Although it will be warmer ‘down south’ in Salford Quays, a bit of speed won’t go astray in helping me stay toasty 😀 . It’s also been a bit of a whirlwind organising a ‘practice’ swimrun event under race conditions. 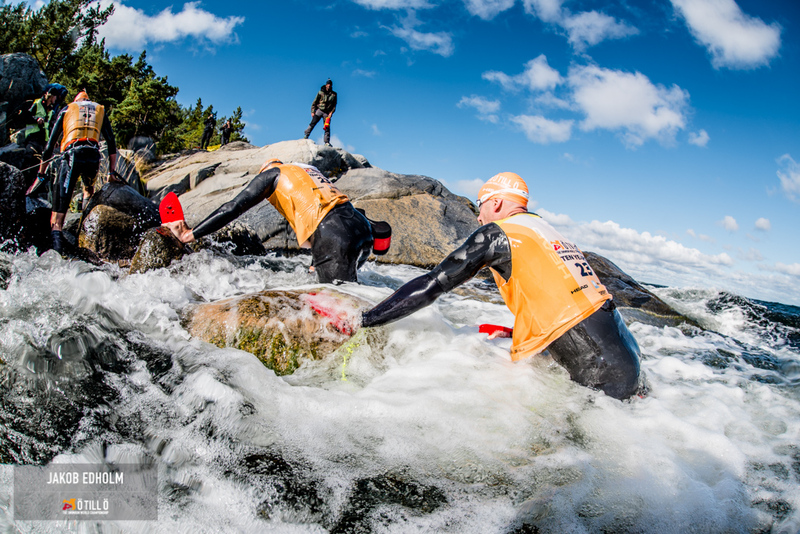 With a last minute change of plans, we’re heading out to do Borås swimrun (near Gothenburg, Sweden) in less than three weeks’ time (gulp). It’s an event that’s about a ‘half distance’ Ötillö, but with more transitions per km and significantly more ascent on the run. This is focussing our minds nicely! Meanwhile I just need to learn how to pronounce Swedish words. “Er-Till-Er” ? “Bor-oarse” ? Keep an eye out for more progress reports. You’ll be able to read about how we’re getting on here, at 220triathlon.com and sleepmonsters.com. And if you’re doing a similar event and want top tips, look out for our advice articles for Loch Gu Loch entrants. This will be a great swimrun event based around Loch Ness on 26th Sep. We plan to be there too, assuming we’ve survived the Swedish version! We’re learning as we go along and are more than happy to share what we find out. Many thanks to our sponsors and supporters: Head Swimming, Beet IT and Chia Charge. Have you heard of Ötillö? People have been asking me for a few months what my plans are for this year. I’ve had to hum and ha, because I knew what I wanted to do, but didn’t know if I would be able to do it. 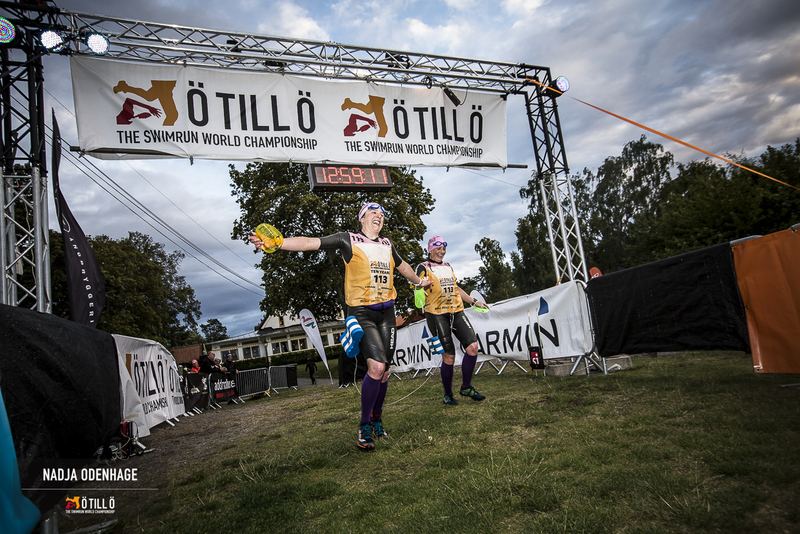 Ötillö is the SwimRun World Championship held in the Stockholm archipelago. In a team of two, you start on one island at the top and make your way across over 20 more, swimming between them and running across them until you get to the end! After I set my heart on this race, the first challenge was finding someone willing and able to do it with me! Just two weeks before the closing date, I hooked up with Izzy. Perfect! She is in the same club as me and we are very similar ability. At Celtman we finished within 4 minutes of each other. The next challenge was making our merit application. As well as listing our top race results from the past two years, we had 500 characters to convince the organisers to give us one of only 6 merit spots for female pairs 😕 . Tension built in the run up to the announcements. We heard that there were more than four applicants for each space. Then we were told the merit selections would be made two days early. On Wednesday morning I was in a state of high tension as I checked down the list as soon as it was published. Would we be judged good enough? Were we the sort of team they were looking for to be a part of this race? Past the male pairs, onto female, past race qualifying listings, onto merits. Not there, not there, then … last on the list, there were our names!! I leapt out of my chair and ran down the office making excited squeaking noises 😀 . We first met at a cold, grey lakeside. We jumped in. As the wind whipped up waves we swam another lap. In 2012 only 9 women did Celtman Extreme. We were 2nd and 3rd. Izzy took a year off and created a business inspiring others to get outside and make the most of life. One tough race wasn’t enough for Rosemary who hasn’t stopped since. 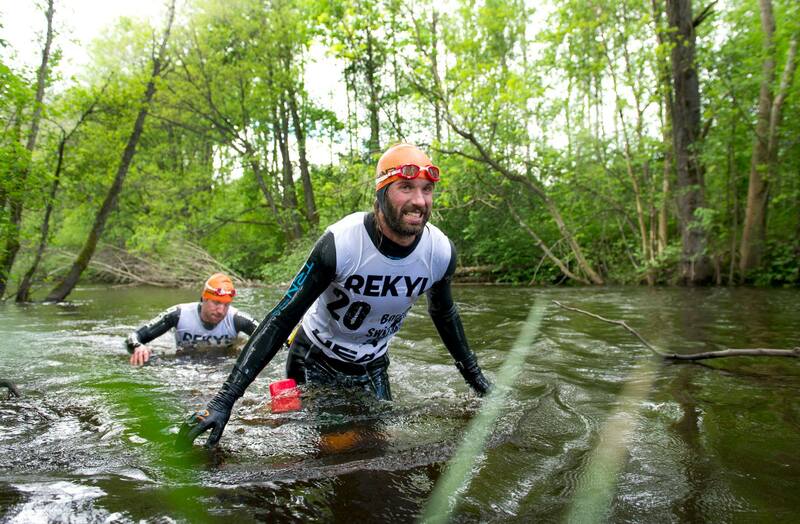 UK SwimRun interest is booming. We want to experience the original and tell everyone about it! 220triathlon.com will report on our race. The journey is calling.